Design your own custom street map based on your favorite cities or neighborhoods. Dimensions: Art: 18" x 24"; Overall: 21" x 27"
Gave a map of Athens, Georgia to my husband for his birthday. He loved it and is one happy Georgia Bulldog!! Like urban lace, Cut Maps showcase the unique patterns formed by city streets, parks, landmarks, and natural boundaries. 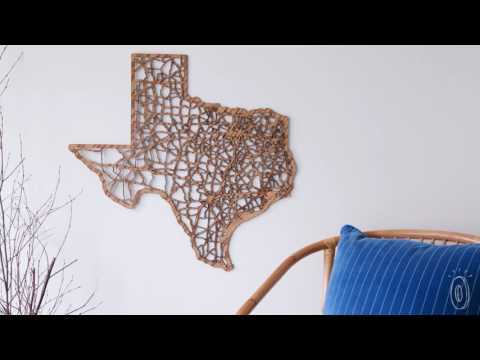 As a mechanical engineer, Dan Linden explores the intersection between technology and art in his laser cut wall art and other accessories. His foray into this form of location honoring was personal—he did a tracing of his former neighborhood in Columbus, Ohio, for a local fair. The response was overwhelmingly positive—people started requesting minimalist renditions of their own hometowns. Since then, Dan’s maps have dressed up walls and protected phones with all your favorite locations. His designs now trot the globe with over 40 cities represented. To residents, the streets and neighborhoods don’t need any labels. You can instantly recognize addresses and stomping grounds. To the unfamiliar, the geographic details are an invitation to explore new territories. We find Dan’s work a powerful channeling of place. Just like a traditional map, Cut Maps remind you of cities you’ve called home and feed your wanderlust.